I have recently spent two very pleasant days on one of our better freestone streams, one fishing for my own account and the other guiding a very amicable, knowledgeable and competent angler. The waters hereabouts are currently still running quite full after the winter rains, in fact the season itself has only been open for a matter of weeks. Despite the freestone nature of the waters however they rarely if ever actually get dirty with perhaps a little hint of tan colour from the peaty grounds at their source being as bad as things are going to get. That means that much of the time one can sight fish although in the high water that is still tricky it is on occasion possible. Now the odd thing about that past couple of trips was that the fish weren’t exactly where I was expecting to find them. Generally speaking in higher water one would seek out the wider sections where laminar flows make for easy pickings. Water that as the levels drop into summer will be either devoid of fish or at least practically unfishable, too still and too shallow to allow anything like a sufficiently delicate presentation. Perhaps it was a lack of insect life , there weren’t any real hatches on either trip, although there were a few midges and micro caddis knocking about. Not enough to bring the fish up really and we saw few rises on either day. Despite that I was still focusing my attentions on the flats, classical dry fly water with laminar flows, clearly defined current lanes and bubble lines that should have been heaving with trout. But they weren’t and without rising fish to assist it was a case of hunting them down and drumming them up, if that isn’t an oxymoron in the first place. I have always felt that the best anglers are in tune with nature, one of the great levelers of fly fishing is that you have to deal with things the way they are on the day. The trout, the weather, the hatches (or lack of them) nor the water levels are going to give a jot about what you want. Nature is as you find it and although we as a species are so used to manipulating it to our own ends when you are out fishing a little humility goes a long way. So despite hoping, even expecting the fish to be on the flats and willing to come up through the shallow water to take a dry fly that just wasn’t the case. Now one of the great lessons of nature is that everything and I really mean everything lives by certain rules. Not the sort of rules laid down by politicians, with hidden agendas and frequently a lack of pragmatic purpose, no, natural rules are always pragmatic. If you see a fish in a particular spot on the stream trust me that he (or she) is there for a reason, you may not know the reason but it isn’t random. Wild animals don’t have the luxury of random behavior and one of the greatest rules of all is that you have to take in more energy than you burn up. If you want to grow fat, produce eggs and sperm and have sufficient life left in you to enjoy mixing the two it behooves you to build up something of an energy credit over time. The two obvious solutions to this are to either take in a lot of energy (that is food) or to be very careful with what you expend. Most animals actually take advantage of both depending on circumstances. So anyway back to the fishing, there wasn’t anything much of a hatch on and the fish were going to be doing all they could to get what food they might manage at minimal cost and we found almost all of them in precisely that sort of spot. Right in the backs of the pockets. At first glance the pocket water, and particularly this early season and rapidly flowing pocket water, didn’t look like a low energy place to hang out. But we only found fish right at the back of those pockets and on one occasion were able to sight fish to a trout that was clearly visible even in the undulating current. He was doing exactly what nature intended him to do, sitting quietly in the midst of the maelstrom without so much as a flick of the tail until he decided to intercept a morsel from the drift. I have watched this behavior over and over and it rarely fails to fascinate me. Despite the fact that so many angling books have neat little diagrams of cartoon like fish hiding from the flow behind the boulders that is actually something of a rarity in my experience. They might expend little energy in such a spot but they can’t see the food coming. So certainly in our waters they are far more likely to be balanced in front of the rocks, either submerged ones or not. The trout have learned that they can balance on the pressure wave in front of the boulders in exactly the same manner that a dolphin will balance in front of a moving ship. The only difference being that in the trout’s case the water is moving and not the rock. In each instance there is a defined pressure wave where the water is unable to escape and is forced to “bounce” back providing a counter push of equal and opposite force. With its tail delicately on that boundary and with some pretty canny adjustments of balance a fish can sit in such a place all day and barely move a muscle. He is in effect “body surfing” on the wave and holding station as a result. The additional benefit is that the fish can see and intercept any food both surface or subsurface coming through the pocket, has maximum time to spot it and can measure if it is worth giving up the comfort of his aquatic cushion to grab it. Particularly in the higher water conditions with which we found ourselves it was obvious that being at the head of the pocket, even if it could provide some protection from the current couldn’t give sufficient time to select food items from the drift. So was it that virtually ever fish taken on both days, well over 60 of them, was taken from the very back of the pocket water. The fish coming up to a dry or intercepting a nymph at the very lastmoment when you have convinced yourself that the drift is already over. For the angler it can be problematic, not least because unless you know about this little trick of the trout you will continuously lift the fly off just as it is getting into the right place and if you are fortunate you will hook more than one by accident as you lift up for the back cast. There is a further trick to fishing like this though, you have to cast short with a long leader and you have to get close. Any line or leader touching the water at the very back of the pocket were the current speeds up will drag the fly immediately. This is “high sticking” as we call it around here, virtually dapping I suppose. Any amount of actual fly line beyond the minimum will sag as you hold the rod up and equally drag the fly. These trout in the pockets are no less aware of drag than their smooth water counterparts and we never had a single fish take a dragging fly. Presentation is the business here, presentation and a knowledge of where to look for the fish. There are numerous other examples of the energy equation. 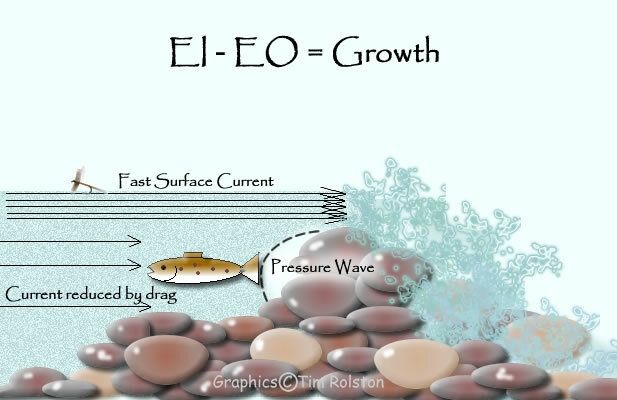 EI-EO=Growth, (where EI is energy input and EO is energy output). If you want to become a better angler it will do you a lot of good to spend some time considering that equation each time you head out onto the water. It is probably the same equation that causes fish to feed at times when the hatches are at their heaviest and perhaps even focus on only one insect at a time for that matter. Mad rushing about isn’t going to pay dividends in the long haul and the fish know it. . It is infuriatingly the same equation that says to the fish, don’t bother to feed at all if there isn’t a lot of food about. On very fertile streams that actually becomes something of a problem because if the fish have decided not to feed , well you simply can’t catch them. On my slightly acidic home waters the fish can rarely afford to be quite so choosey and although they will make the most of things when there is food in abundance they can’t really afford to miss out on a meal, even a small mouthful when it presents itself. So they will usually be very careful not to burn energy unnecessarily whilst at the same time giving themselves the chance of a meal should one come along. It is fascinating stuff, but as with all things in nature, eminently logical when you take a good look at it. It is one of the reasons why I do so love to watch fish when the situation presents itself, you can learn a lot by watching the behavior, particularly if you keep a mind on that equation. There is a purpose to everything and understanding that can’t fail but help you to become a better angler. Mind you I am being a bit smug, as I said, we got it wrong to start with. Which brings up another great law , this time of fishing “if what you are doing ain’t working, do something different”. Dislaimer: From time to time these posts attract advertising, the writers of the blog have no control or association with such adverts nor do they receive any financial or other remuneration from such advertising. Whilst they may be of interest and value to you their attachment to these posts does not imply recommendation or endorsement of the products or services advertised by anyone associated with the Fishing Gene Blog.